A short cruise on bamboo junk along Trang An river. You will see limestone karst mountains with rice field on two side of river. See farmers work on the field from seating-rider. Lunch at local restaurant with famous dishes: Toasted rice, Goat meat. 8:00: Tour guide of Motorbike Tours Vietnam will welcome you at the hotel; take you to the garage, practice with motorbike before starting. And tour guide will not talk about some notes while driving in Vietnam. 8:30 Beginning drive to Cuc Phuong National Park, along the way you will see the vast rice fields, and farmers are working hard on the field. 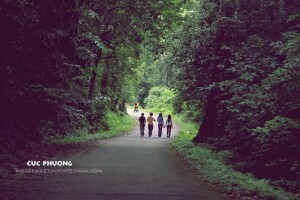 When in Cuc Phuong, you will feel a fresh and pleasant atmosphere, leaving the noise of the city. Established in 1962, Cuc Phuong is the oldest national park in Vietnam. Located only 120km southwest of Hanoi and nestled between the provinces of Ninh Binh, Hoa Binh and Thanh Hoa, Cuc Phuong boasts an engaging cultural and wildlife heritage and enchanting scenery. Lunch at stilt house, deep in the forest. 14:00 Departure a short trekking trip into the depths of the forest. Tour Guide will lead you through the small path, feel the taste of their own forest. You will visit a variety of different plants, trees thousands of years old. Dinner at stilt house. You can stay and sleep at home stay or private room with fully equipped. In the morning, we will go straight to Hoa Lu ancient capital city. Visiting the Dinh & Le Temple, restored in the 17th century the temples are dedicated Dinh and Le emperors and believed to be built on the original foundations of the old palaces from the 11th and 12th centuries. The journey continues to Trang An complex. The entire cave is home to 50 of Trang An caves connecting 30 small valleys which follow about 10 kilometers from North to South. 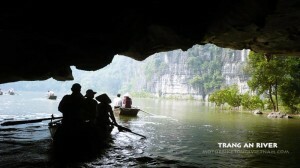 This is the perfect destination for who loves nature and discover the magnificent caves of Ninh Binh. Guests will seat on bamboo boat to go on the trip about 3 hours. Sitting on the boat you’ll see firsthand the beautiful scenery of the mountains, go through many caves lie under the mountains. Afternoon: Depart to Hanoi, along the Ho Chi Minh trail. The way, that is a legend in the history, it was built and operated during the Vietnam War (1955 – 1975). Now it has been rebuilt, you can see a lot of changing on two side of road. Arriving Hanoi about 5:30 PM. The trip end, a good trip on next time. I am travelling by myself and wish to join your two day red delta motor bike tour with other members of a group departing 28july2014. Can you confirm a place for me and your cost. Hi Greg. I was send an email to you, very glad to know you, pls check your inbox. Looking forward to receiving your mail soon. Best regards!